Welcome to the Emerald Empire! One of the most popular samurai RPGs has been reborn, with new rules, clarifications, and special guides to help you get started in the incredibly detailed world of Rokugan. Within these pages, you will find everything you need to recreate your own characters for use in Legend of the Five Rings' Emerald Empire. 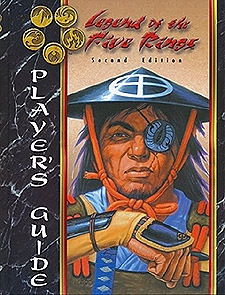 Easy to get started: The L5R Player's Guide is packed full with detailed descriptions of the Emerald Empire, rules and character creation guidelines, schools and techniques, complete skills lists, and advantages and disadvantages to help new players and experienced fans interact with Rokgan's culture and society. Step-by-step character generation: Pick a Clan, pick a profession, spend a few points and you are on your way to adventuring in the Emerald Empire. Flexible rules: The L5R RPG uses a simple system to smooth character creation, so that players and Game Masters find it easy to create adventures - and heroes. All new spells and schools, New bushi schools, an entire chapter of new spells, simplified weapons and armour rules, and updated storyline information are all packed into one incredibly detailed book.